Today it's nothing to see a film use CGI enhancements. We've even created fully computer generated characters and actors. But in 1982, talk of using computers to make movies was crazy. A small group of innovators did it anyway, with Tron. 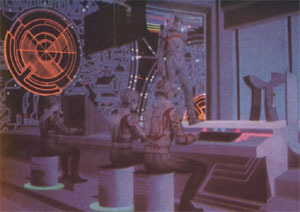 Using a combination of backlighting and state of the art computer generated images, the people behind Tron created a world that exists INSIDE the computer. Ruled by an evil Master Control Program, computer programs are enslaved and forced to play games as part of the MCP's bid to control the outside world by controlling all of its information. When a young programmer named Flynn (Jeff Bridges) attempts to hack into the system to find evidence against the MCP's human partner in our world, the Master Control zaps him and brings him INSIDE the computer world, to play in the games, and die. 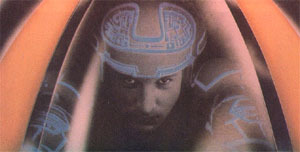 Instead, Flynn teams up with a security program named Tron (Bruce Boxleitner); fighting with him to contact Tron's user and get the information they need to free the computer world from the Master Control's tyranny. It's hard to get across to today's audiences just how AMAZING this movie was for its time. In 1982 many people had never even SEEN a computer, let alone used or owned one. Computers were not the little desktop affairs we all have sitting on our desks. They were gigantic contraptions, housed in massive rooms filled with tape reels and gaudy blinking lights. They were mysterious, strange, and seemingly intelligent machines. While the existence of thinking programs inside a computer world is ridiculous to today's audiences, to the people of 1982, it seemed almost plausible! Before long, everyone assumed machines would be thinking like people, and no one really knew what was next. 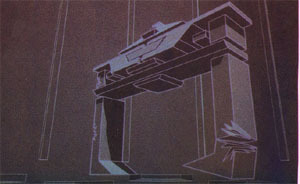 But beyond that, Tron heralded the beginning of a special effects revolution. This was the FIRST time anyone had ever used a computer to make a movie! It was unheard of! Most people didn't even understand how it worked. 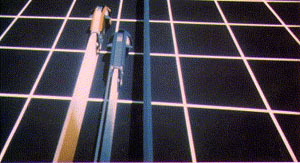 So ignorant was the movie public that Oscar disqualified Tron from being nominated for a visual effects Oscar, because, in their words "Tron was cheating" by using computers to create visual effects. Yet it is because of Tron that we have entire film studios dedicated to making movies the TRON way. Pixar pumps out movie after amazing movie, Dreamworks makes millions off of a computer animated ogre, and they do it because of Tron. As a child, I still remember the first time I saw it. We were at a local drive-in. I must have been no more than 5. We were supposed to be watching Snow White, but I was bored and instead peered over my dad's shoulder, across the field to the movie screen behind us... to a strange movie of amazing lights and colors. A black place where warriors made of light battled each other with spinning discs of power! It was mind blowing! I spent that entire night standing and looking in the opposite direction from everyone else. While they watched Snow White, I watched Tron without the sound. I was hooked. Tron opened an entirely new world for me. Like most 5 year olds I was crazy for dinosaurs. But after Tron, no more! For the next few years, every time my friends and I got our hands on a Frisbee, we played Tron. Hours spent fighting over who got the blue Frisbee, and pretending to loft our Identity Discs to our users on high. Flinging them at each other with wild abandon, blocking, rolling, and in our heads, defeating Zog and the Master Control over and over and over. Now, Tron is on DVD, and looking more beautiful than ever. Even when it was first released, I don't remember the picture quality being this good. It's crystal clear and beautiful. Sure, by today's standards this film is dated, but the 1982 magic is still there. Thankfully, Tron has been given the proper treatment in a DVD LOADED with extras and wickedly cool Tron inspired interactive menus. 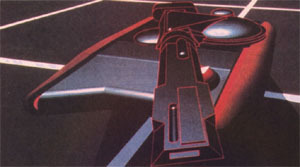 Tron lovers will thrill at the hours and hours of documentaries detailing the crazy ideas used to make this film work. Personally, I loved the fact that none of the actors even UNDERSTOOD what they were making.... except Jeff Bridges who seemed to get it right from the beginning. This DVD is an ode to one of the most ground breaking special effects films of all time. Buy it and dig in. If you watch carefully you may just hear a hint of Tron 2.0 on the wind.